In her honour I eat something sticky. Nicky, of course, Works For Cheese. So a "toasted" grilled cheese sandwich is an apt response to today's prompt. Hit up the links on her blog to see how the remaining cheese lovers reacted to today's prompt. Oh, I want that toasted cheese sandwich! A sticky widget? Maybe I can put it in my sidebar. Dufus, you are brilliant. I love the ode and the toasted cheese. Ah, this was a tasty morsel of wit! Now off to make a toasted cheese sammie. Yeah, it was just cheesy enough. Thank you. 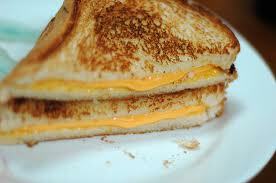 I love grilled cheese. I'm a sneak when it comes to grilled cheese. I toast two pieces of bread, then place a cheese slice between them and put in the microwave for 15 seconds to melt the cheese. Then I eat it with ketchup. I know. I'm lazy. Oh, no. She's a sick. Believe me. It's a bit of both actually.